Many staff hold first aid qualifications, and there is always an identified first aider on the premises. If a child is taken ill during school hours we may contact a parent/carer. Please do keep us informed of any changes to your contact numbers. If your child has a chronic health condition, please discuss this with the School Administrator. Unfortunately we are unable to administer medicines unless they have been prescribed by a doctor. If your child needs medication during the school day a medicine administration form must be completed by the parent/guardian and given in to the school before medication can be administered to the child. All medicines should be brought directly to the school office at the beginning of the day. If it important that the school is notified promptly if your child is absent from school due to illness. On return to school a letter or email must be sent to the school explaining the reason for absence. Where possible can you please inform the office in advance of any doctor or dental appointments. A copy of the appointment card or letter will also be required to enable us to enter the correct code on our registers. should also avoid visiting anyone in hospital during this time.  Wash contaminated items of clothing or bedding separately on a hot wash.
 Don’t share towels, flannels, cutlery or utensils while you or your child is ill.
 Flush away any poo or vomit in the toilet or potty and clean the surrounding area. spread to others very easily. Call NHS 111, your GP or a Pharmacy if you’re concerned or need any advice. diarrhoea tends to last for about 5 days. For online advice see www.what0-18.nhs.uk – search ‘diarrhoea and vomiting’. Click to download – Healthier Together – should your child go to school today? How long should you child stay away from school if he or she is ill? It is important that we are notified in the case of an infectious illness. We also request you to keep us up to date with your phone numbers, so that we can contact you in cases of sickness or accident. If you discover that your child has head lice, please seek medical help from the pharmacist or your GP. It is also important for you to inform the school office or class teacher if you find your child has head lice so we can reduce the risk of it spreading. The Governors of Shalfleet Church of England Primary School recognize and accept their responsibilities for the establishment and maintenance of the Health and Safety and ensure, so far as is reasonably practicable, the health, safety and welfare of our staff, pupils and any visitors to our premises. 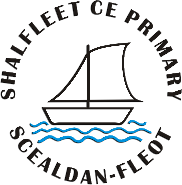 The Governing Body of Shalfleet School is committed to safeguarding and promoting the welfare of children and expects all staff and volunteers to share this commitment. It may be helpful to parents to know that the Authority requires head teachers to report any obvious or suspected case of child abuse – which includes non-accidental injury, severe physical neglect, emotional abuse and/or sexual abuse. This procedure is intended to protect children at risk and schools are encouraged to take the attitude that, where there are grounds for suspicion, it is better to be safe than sorry. This does mean that Headteachers, on occasion, risk upsetting some parents by reporting a case, which, on investigation, proves unfounded. In such circumstances, it is hoped that parents, appreciating how difficult it is for Headteachers to carry out this delicate responsibility, would accept that they were acting in what were believed to be the child’s best interests. The School Nursing Team is now able to offer a programme to advise and support any family/child who feel they need to make changes for a healthier lifestyle. The programme runs for 12 weeks and would involve regular contact by telephone and meetings. If you are interested please contact your School Nurse on 821388 to see if this programme could help your family.